Santa Anita Park Opening Day Saturday Picks and Plays: After a deserved break, Santa Anita Park is back offering thrilling races this weekend including five Breeders’ Cup “Win and You’re In” stakes on the Saturday card. Rising stars are trying to earn a spot in the Breeders’ Cup race for juveniles, Beholder is ready to confirm her current shape in the Zenyatta Stakes GI, Bayern is looking for a resurgence to defend his crown in the Breeders’ Cup Classic, and the wide open turf division for fillies and mares are looking for an entry in the Breeders’ Cup Fillies and Mares Turf. 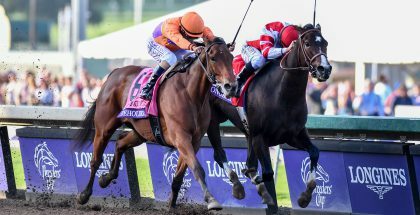 We analyzed all five Breeders’ Cup “Win and You’re In” challenge races at Santa Anita Park and formed inexpensive plays to participate all day. Nyquist is the current two-year-old leader in California and he deserves respect. In theory his pedigree indicates he should not feel comfortable running over two turns but the way he has been winning suggests he can overcome his bloodline. Swipe is by Birdstone, so he will appreciate the stretch out to 1 1/16 miles. Nyquist beat him in the Del Mar Futurity GI but the FrontRunner is totally different. On Fire is moving up in class but he is improving greatly in each race. 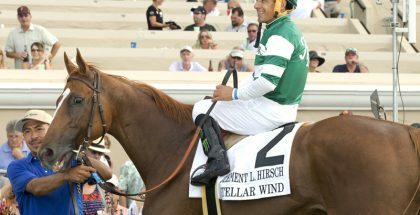 Take into account that his trainer, Simon Callaghan, usually takes his time with his horses indicating On Fire will be ready to show all his potential in this race. Hawkedon is back to his game, the downhill, and he has a nice record to prove it with two wins and one second place in five starts. Labour is knocking for a victory since he arrived to America. Mike Smith insists with this horse, so we can’t miss a play with him. Mischief Clem was a decent fifth place in his first race off the layoff and his first attempt on the grass. This horse was considered a good one since his debut. I’m not spending too many lines handicapping this race since everybody expects Beholder’s paid workout. The Pacific Classic hero will use this race as prep for her main goal, the Breeders’ Cup Classic. There’s no value in this race, just sit back and enjoy the Beholder show. Songbird showed a lot of talent when she smashed the field in the Del Mar Debutante. If nothing strange happens, Songbird will win handily again and will become the favorite to win the Breeders’ Cup Juvenile Fillies. The Rodeo Drive Stakes in tougher than a 1000 piece puzzle, so we’re looking for a longshot in this race. Sharla Rae won her first Grade I race of her career on August 15 in the Del Mar Oaks. This field is tougher but she is in great shape and can take this race at good odds. Stormy Lucy probably is not a Grade I caliber filly but she is working very nice for this race and is always in the mix. I’m adding a logical horse, Lady Pimpernel. She really likes the distance and Rafael Bejarano is in the saddle. Bayern looks like the lone speed in this race and he’s a horse who loves to take the lead with no opposition. 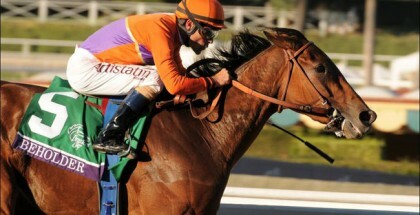 In addition, Bayern is unbeaten at Santa Anita in three starts including the Breeders’ Cup Classic last year. Probably a lot of people forgot about him but he has everything in his favor to win. I’m taking a risk using Bayern as a single, but it’s worth it. The finale is a wide open race and a weak field also. I’m giving the slight edge to Recalibrating, a colt with a nice pedigree for turf and route races. He’s dropping in class and the blinkers added should help him to improve. Nicaradalic Rocks is stretching out to a route distance but he hasn’t run a bad race yet. Strong Values was a decent fourth in his debut paying 55/1 to win indicating he was not ready for that race. Now with a race under his belt, he can improve and win. Osceola Pond disappointed as the heavy favorite in his last start, however I think he can bounce back from that poor effort.